As a showcase of our unique heritage to the world, Non Sans Raison vouches for the savoir-faire of Limoges porcelain. We innovate on all the uses of porcelain to perpetuate the spirit of this millennium material. Everyday we bring new life and new vitality to this material with exceptional qualities and a prestigious history, a history intricately woven with the roots of men. Many centuries ago, our people discovered on earth, a clay called extra white kaolin. After much handling, this kaolin is transformed into the most dazzling and delicate of porcelains, which is sublimated by our decorations, giving to our products all their peculiarity. 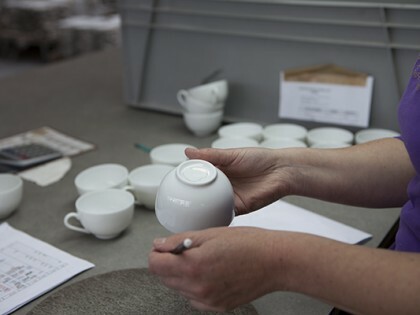 In complicity with our porcelain craftsmen, we bring out the full potential of this white gold from Limoges. By their careful care and technique, we exalt its natural qualities in every product. We remain faithful to our ethics and convictions and are committed to create the highest quality products. From choosing the best materials to maintaining a close surveillance at each step of the fabrication we are fully engaged in a high quality process. 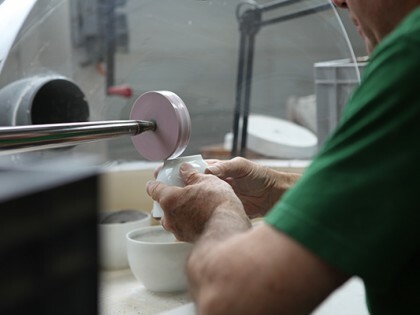 This is why all of our products are handcrafted in Limoges, France, and perfected with a clever dosage of precious metals, ideal temperatures, meticulous finishes and a sense of detail. As a french luxury porcelain maker Non Sans Raison showcases Limoges’ unique heritage to the world and boldly renews Limoges porcelain and tableware while preserving the ancestral savoir faire of Limoges porcelain. It is through innovation that Non Sans Raison, founded in 2008, highlights the ancestral savoir faire of Limoges porcelain by creating in accordance with the ancient traditions of contemporary products commercialized worldwide and adapted to new uses. Non Sans Raison is also known for the diversity and the cross collaborations with artists and visuals designers and the relevance of participative events about the porcelain. Attached to the idea that creation has meaning only in regard of a thought and reasoned approach, Non Sans Raison sees the porcelain as a starting point towards a multi-sensory experience that sometimes escapes from the table. Confronting the tradition of social and culinary uses of today, their objects echo of a lifestyle transformation. 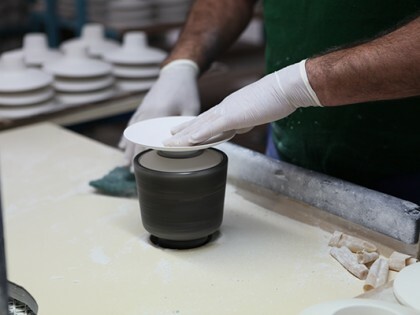 Our professional service can help you to manage your tableware projects and many others porcelain projects by providing a quality porcelain product, made in Limoges. 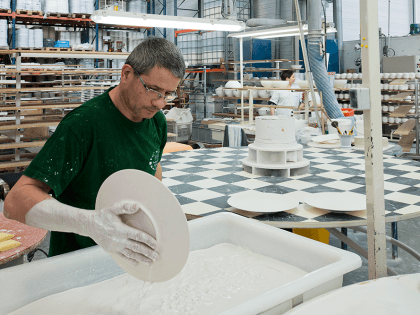 Our services and offers are numerous : we are able to produce your own shapes and all kind of porcelain products or to personalize our white shapes, from a single item to series. Non Sans Raison meets your needs and gathers together a production, creative and consulting team and a varied and well qualified network of trustworthy partners and suppliers to study your concept, your budget, your needs and your constraints. We innovate on all the uses of porcelain to perpetuate the spirit of this millennium material. Everyday we bring new life and new vitality to this material with a very long history, a history intricately woven with the roots of men. We do more than wake a sleeping beauty, standing on the traditions of our ancestors; we arise to the constant challenge of making porcelain reflect our time. And we achieve this working in a balanced and ethical way. Non Sans Raison remains faithful to its ethics and convictions and is committed to create the highest quality products. 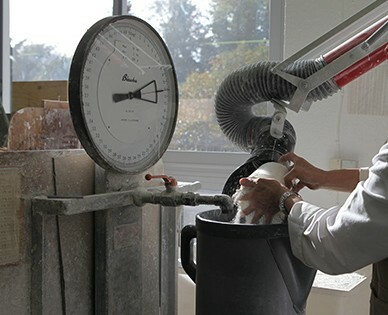 This is why all of our products are handcrafted in Limoges, France. From choosing the best materials to maintaining a close surveillance at each step of the fabrication we are fully engaged in a high quality process. 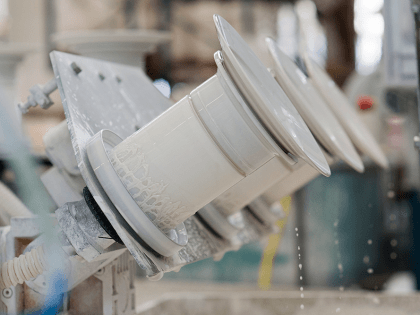 Extra white KAOLIN, white sedimentary clay rock, QUARTZ and FELDSPAR are combined, crushed, sieved, diluted and then kneaded, and finally wrung out. 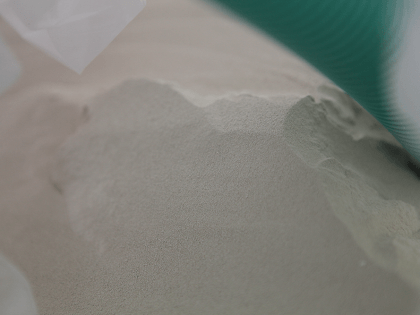 This combination of three powders arrives as a stony mixture that must be diluted in a kneading machine to become ceramic slip. Since then, this ivory cream appears, like bread dough. It is then filtered to remove all the water it contains and wrung out. 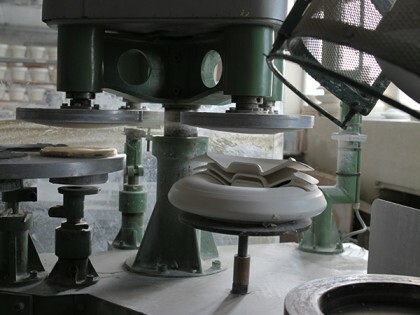 Depending on the quantities and the difficulty of the pieces to be produced, there are three different shaping techniques which are manual casting, pressure casting and manual calibration. For small series and the creation of original and complex shapes, the modeler creates his matrix which is also called “mother” or “core” that he shapes in porous resin. 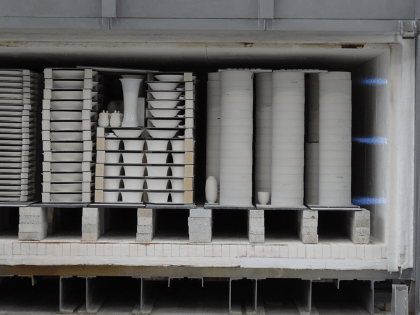 This matrix makes it possible to produce as many plaster molds as the production requires. 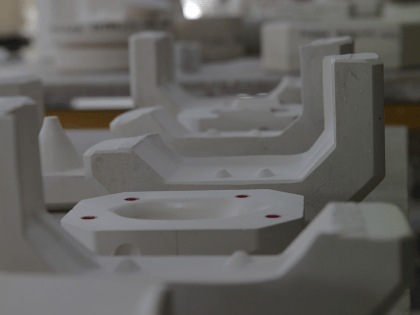 For reasons of quality, these molds are replaced regularly because they can realize a number less than 100 pieces. 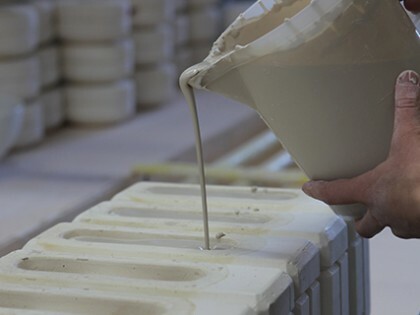 The paste, remained in a slip state, is then poured manually into the mold. Once the excess of slip is removed, the mold dries about half an hour before the piece is removed from the mold. 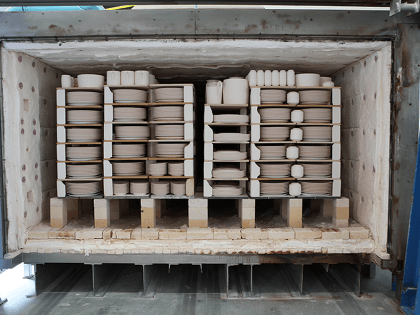 Contrary to the casting technique that uses a liquid paste, the paste required for pressure casting is reduced to powder by the action of high temperature pulsed air. 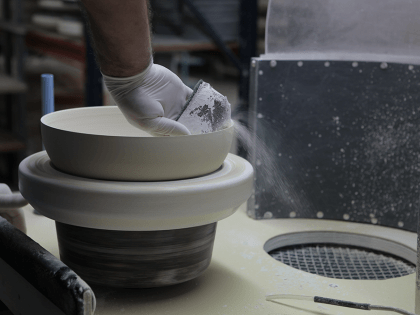 This powder goes then to isostatic pressing between two polyurethane molds, constituting the upside and the underside of the future piece. In this way, the powder aggregates and solidifies. This technique is used especially for mass production. 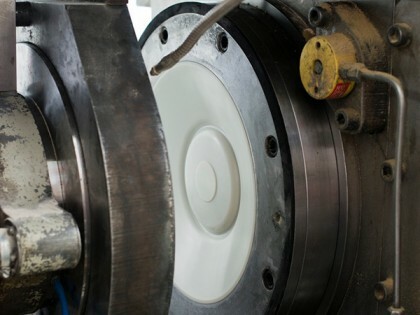 The technique of manual calibration is used for small series and circular and complex pieces. 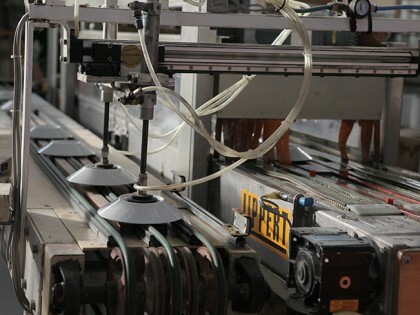 To do this, the paste is first introduced into an extruder from where it comes out in the shape of rolls of paste. These rolls are then pressed on a mold in rotation by action of a calibre. The piece shaped according to these different techniques is then trimmed, mopped up, brushed and dried. At this stage, the particularly friable piece is worked with the greatest delicacy. During the trim phase, different parts such as handles or pouring spouts can be added thanks to the slip and the glue. From that time comes the first firing at 980 °C, called biscuit firing which solidifies the object and makes it porous and thus receptive to enamel. Delicacy and competence are required in this step to leave no trace of manipulation after this first firing. After the biscuits are removed from the oven, they are reduced by 15% in a homogeneous way in all their proportions. They are then dusted by brushing with compressed air. At this stage, another cooking is possible in order to obtain a porcelain biscuit. The object is then fired at high temperature (1. 400 °C) without enamel and without decoration. 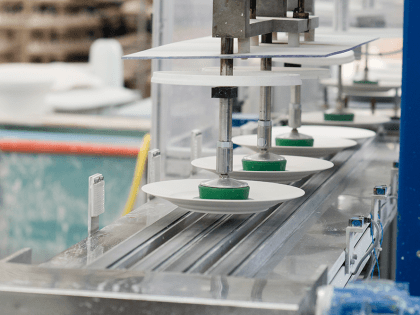 The manual or automatic enameling comes after the first biscuit firing. The enameller soaks every biscuit in a bath made of feldspar and quartz. The object, become porous by the first biscuit firing, absorbs all the moisture of the enamel. By a precise gesture of the hand, the thickness of the glaze is deposited on the piece. Manual spraying is also used for some parts of the object. This glaze transforms the object into a vitrified, white and translucent material. 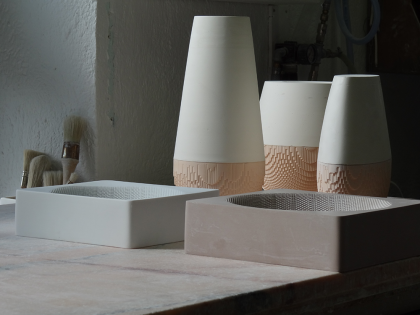 Each piece, dried for a long time in the air, is then checked with a brush before firing. 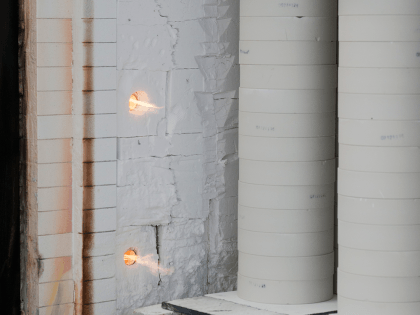 A second firing at 1380° takes place with enameled objects. The objects are stacked inside the oven, protected by the refractory cases called gazettes. This high-temperature firing in a reducing atmosphere causes a deep vitrification that makes the biscuit and its glaze inseparable. After the objects are removed from the oven, a manual or automatic polishing is carried out on each piece. A sorting of objects is also carried out, in order to keep only the first choice. After the second firing comes the creation of the pattern on the piece thanks to the chromolithography or the hand painting or even to the pistol spraying. Another technique is applied by the band gilder to paint bands on plate rims. The piece is centered on a rotating wheel in order to produce a line of constant thickness on its rims. Finally, the last and third cooking of the decorated object takes place between 800 and 1200 °C. This firing fuses the various oxides in the enamel and gives to the porcelain the essential resistance for everyday use. The ceramic becomes non-porous, sonorous, hard, translucent and unique by its decor. The stamp Non Sans Raison is a declaration of a quest for perfection and a manifest to the fame of the porcelain know-how of Limoges. Our insistence on authenticity is reflected in the perfection of the handmade objects, ideal temperatures, attention to details, a meticulous mix of precious metals and well-designed finish. 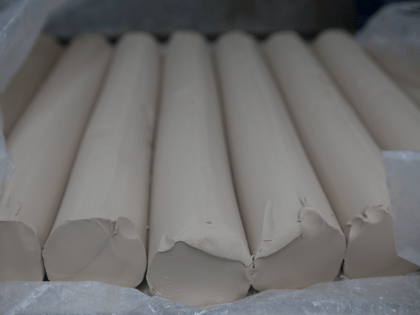 Lightweight, translucent and fine extra light kaolin. Dishwasher safe as many times as you want. Authentic Limoges porcelain. 100% French manufacturing. 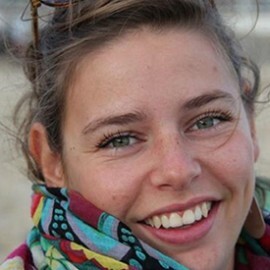 Bertille Carpentier is born in 1985. 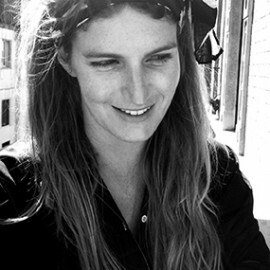 She graduated from ISEM-ESMOD in Paris and has a master in fashion research . 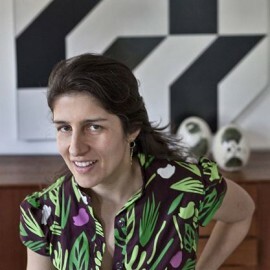 She started as an editor for several magazines print and web in graphic, design and fashion’s sectors. 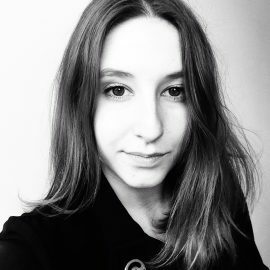 Then Bertille worked as a research manager in marketing strategy and creation in consulting and forecasting agencies. 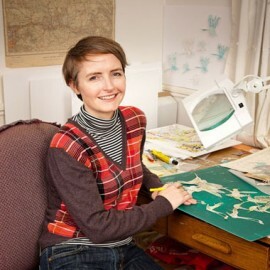 Finally she created Non Sans Raison with the desire to breathe new life into the porcelain from Limoges. 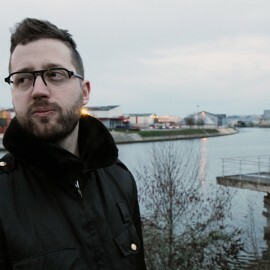 Martial Dumas is born in 1983. 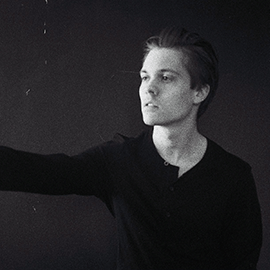 He graduated in graphic art, he began working as a graphic designer in fashion and spirits. Afterward Martial integrated the school ISEM-ESMOD, where he met Bertille. 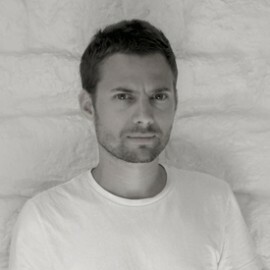 After several experiences in marketing management and design coordination in Haute-Couture, he created Non Sans Raison in 2008. At the same time he created Deuxième Chambre, a studio specialized in top of the range handmade silkscreen printing. 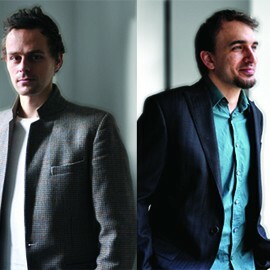 Also Bertille and Martial found Coalition, a consulting agency for upgrading products. The agency deals in perpetuating and bringing products made with ancestral craftsmanship up to today’s standards. Today, Non Sans Raison is present on the hotel trade market, in high-end restaurants and in selective suppliers in some concept stores and galleries. Non Sans Raison is attending important designs events like Maison & Objet, Designer’s Days, Agora Bordeaux, Paris Design Week, Meet My Project, Art Basel Miami. 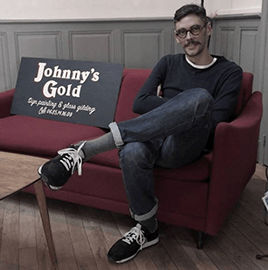 Non Sans Raison exhibited at the Joyce gallery in 2008, the Lyon’s Hotel de Ville, in 2010, the New York’s FIAF’s Colette Carnival, the London’s Flow gallery in 2012, the Lieu du Design in 2013 and at the Miami Design Bridge in 2014. The brand collaborates regularly with Colette, the trade shows Who’s Next and Première Classe in some participative events like culinary and artistic workshop about the porcelain. The national museum Adrien Dubouché reserved to Non Sans Raison an exhibition in 2015.On this occasion, a book was published by Les Ardents Editeurs. In March 2016 at Première Classe, they launched Non Sans Raison Tasting room dedicated to the organization of original and tailor-made culinary events. 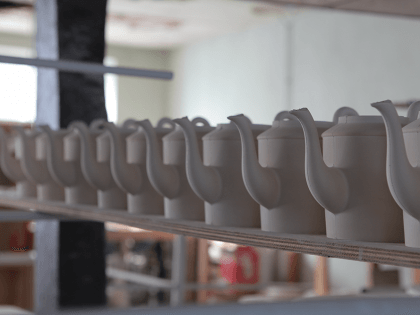 In 2017, they collaborated with the Bordeaux Food Club and participated in the exhibition Constellations Porcelaines in Limousin and a retrospective of the brand was organized at the Tursan ceramics house. Encouraged by this success, Non Sans Raison prepares its diversification to better represent the potential of Limoges porcelain today. 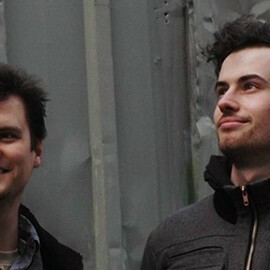 This year, Non Sans Raison will celebrate its 10th anniversary!